With almost 100 films in competition, the Official Selection features thirteen independent documentaries from nine different countries, including seven New York premieres and five world premieres. This year’s program focuses on consumption and capitalism, in addition to historical memory and governmental abuse of power. The festival will launch on September 29 with Vencidxs (Defeated), a world premiere documentary featuring first-person testimonies about the Spanish Civil War, unveiling individual efforts to recover a country’s historical memory. The closing night lineup, on October 1, will include three inspirational films from the Middle East, Morocco and the U.S. The last film, 1971, will remind us that before Watergate, WikiLeaks and Edward Snowden, there was Media, Pennsylvania. A story that will inspire audiences — young and old — and encourage them to think hard about the relevance of nonviolent, civil disobedience while reminding people what it means to be an engaged citizen. 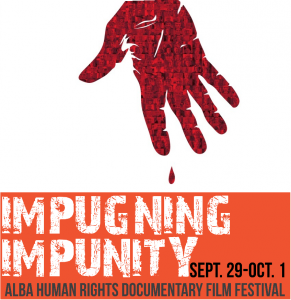 In an effort to support the promotion of independent human rights documentary filmmaking, ALBA has established the Harry Randall Award to recognize the best film from the Official Selection. The award is named in memory of Harry W. Randall, Jr. (1915-2012) who served in the Abraham Lincoln Brigade during the Spanish Civil War as Chief Photographer of the Photographic Unit. The 2014 jury is composed of accomplished actor and Emmy-Award winner Peter Coyote, human rights advocate Bryan Stevenson, and filmmaker and activist Pamela Yates. Tickets are $5 for the general public and free for students. 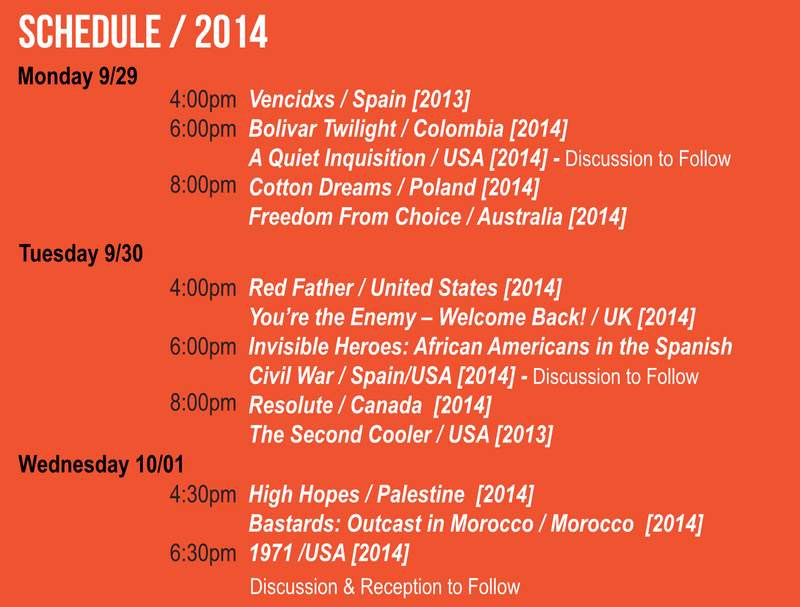 Festival passes with access to all the screenings, Q&As and closing reception, are available for $20. The Festival is made possible in part with public funds from the Fund for Creative Communities, supported by New York State Council on the Arts and the New York State Legislature and administered by Lower Manhattan Cultural Council. With the support of the Puffin Foundation, Instituto Cervantes New York, Ambulante and Skylight Films. See below for the screening schedule; for the brochure, including descriptions of the films, click here (pdf). For trailers, click here. Through personal testimonies, Vencidxs (Defeated) documents the story of over 100 people who lived during the Second Spanish Republic, the Spanish Civil War and subsequent repression by the Francoist dictatorship. Vencidxs is an exhaustive investigation on the recovery of a country’s historical memory. In 2006, the newly elected government of Daniel Ortega in Nicaragua overturned a 130-year-old law protecting therapeutic abortion. A Quiet Inquisition documents the harrowing implications of this action against the backdrop of a political, religious and historically complex national identity. As the stakes rise, one doctor’s outrage transforms into willingness to act boldly in the face of the new situation. Through one family’s story, Cotton Dreams delves into the human cost of biotechnology and how it is affecting rural Indian communities. Life is about choice. What we eat, what we read, who we elect; every day we make choices that determine how we want to live. Presented in an entertaining style, Freedom From Choice is a film not about the choices we make, but rather the choices that are being made for us. Red Father examines the life of attorney and Lincoln veteran Bernard Ades from the perspective of his daughter Naava. You’re the Enemy – Welcome Back! is a story of healing and reparations as a group of Vietnam veterans return to the land of their former enemy. Invisible Heroes tells the story of the 85 African Americans who in 1936 joined the International Brigades in support of the Spanish Republic. This is their story, an untold chapter in the history of both the United States and Spain. The adventures of unsung heroes who answered the call of a distant war to fight for their own freedom. Resolute recounts one of the most grievous human rights violations in Canadian history, the devastating effects of forced relocation for the aboriginal people of Resolute Bay. Through interviews, archival footage and experimental animation, Resolute tells a story familiar to thousands of indigenous families in Canada and elsewhere. Narrated by Martin Sheen, The Second Cooler is a migrant-justice documentary which offers insight into who benefits from illegal immigration while bringing major systemic issues into focus. High Hopes recounts the forced displacement of Bedouin refugees living under Israeli occupation and their relocation to a garbage dump. Bastards: Outcast in Morocco, is a poignant documentary about one woman’s struggle to have her sham marriage recognized and her daughter legitimized by the Moroccan judicial system. A compelling portrait of Moroccan society and its attitudes toward women, female sexuality, their position in society and access to education. In 1971, eight ordinary citizens broke into an FBI office in Pennsylvania. Calling themselves the Citizens’ Commission to Investigate the FBI, they removed every file in the office. Mailed anonymously, the stolen documents started to show up in newsrooms. The most significant revelation was COINTELPRO, an illegal secret surveillance program overseen by Bureau director J. Edgar Hoover. Despite one of the largest investigations ever conducted, the FBI was unable to catch the burglars. 1971 examines the consequences and implications of the burglar’s actions—then and now.